Discussion in 'Species Identification - Identify Your Hermit Crab' started by j'field, Sep 25, 2009.
j'field Hi, I'm New Here! Hi, I just bought 2 hermits 2 days ago. Can any kind soul help me ID what species are my hermits? Their average lifespan in captive? And also how big can they grow up to? Yup, Hermez is right, you have a Ruggie. They're pretty rare, congratulations. 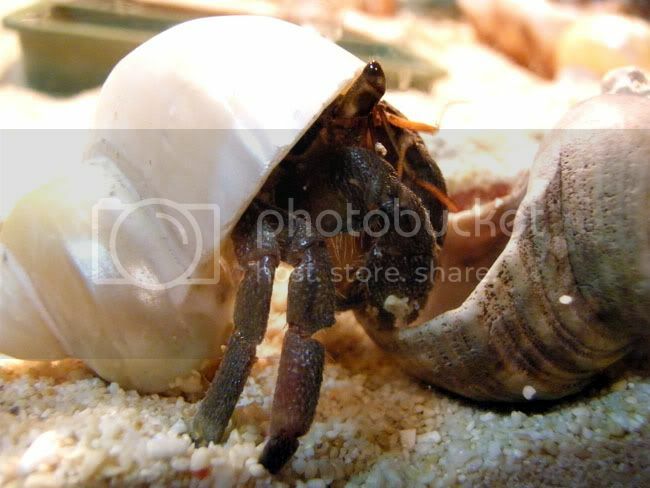 Hermit crabs can get to baseball-softball size, but it takes a while. Like, 20-30 years if it starts off small, maybe a little more. Careful, becuase ruggies are not really a 'beginner' species. 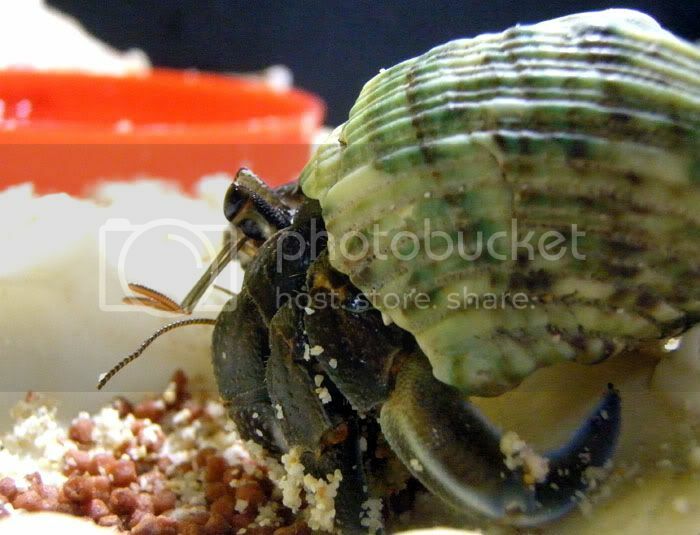 They love salt water, be sure to provide it in their tank(and every other hermit crabs' tank). They're a very sensitive species, to heat and humidity changes, and(in case you don't know this yet) the average temp. in tank should be 75, average humidity 75. No lower than 70 or higher than 83 in both temperature and humidity(for exception of Strawberry hermit crabs, who need solid 80 in both). As long as you provide Salt and fresh water, have correct humidity/temperature, they should be fine.Please search around the site for extra info, and be sure to ask any questions. Your hermies are the cutest ever!!! The only ones I can find are PPs and 2 Es. Did you get them at a pet shop? Ruggies look very peculiar to me. I almost thought they were aquatic when I first saw them. That's irony. Cos I got the Ruggies from a pet shop in my country. And they only sells those. No other hermits. Actually I keep marine tank too. So I guess I can use the saltwater and sand which I have for them as well. I've did a image search on Ruggies, but I feels that mine look much darker in color compare to the pics I've find. And again thanks so much for every individual that reply. I will definitely read and research more about them. "Hermez" said in the above post that it was eye crust and would be back to normal after a molt. Crabs can regenerate their entire eyes if they do get cut off, although it takes a LOT of molts to do it. As for the coloration differences, there are lots of different colored crabs in any species. PPs can range from a pale pink that's almost whitish to almost black, and every other species usually has a pretty wide "normal" coloring range. Crabs get their coloring based off the nutritional content in their diet - the more tannins and other natural colorants they eat, the darker their coloring will be. Welcome!! Your hermies are so adorable!! Ruggies(C. Rugosus is their scientific name) come in all colors pretty much, that's what makes them hard to identify. They are often mistaken as Ecuadorian hermit crabs(search google for a pic of Ecuadorian Hermit Crab and you'll see the resemblence). The main difference between the two is that Ruggies have dark blotches on their eyestalks, while ecuadorian's eyestalks have no blotches. Anyway, like I said in the first sentence, Ruggies come in all colors so it is okay that your rugosus hermit crab is black. I know that Hermez has a black rugosus too. If you want more info about identification between the ruggie and Ecuadorian hermti crab, I have a ton more, I just didn't want to make this post so long that you wouldn't want to read it. Thanks all again for all your patience and replies. And OneOnion, of cos I wouldn't mind reading more info that interest me. So please do let me know and learn more about these cute little creature and of cos share more with me. Hi, does this hermit looks familiar? Yes, I was surprise that it molted once and also change to a new shell within just more than a week since I bought it. Is now more active and looks bigger as well. By the way, from the pic I think it still miss the old shell by exploring it. Lol! I will start posting pics of my crabitat in the other thread. I am still new in this. So all your advice and comments are important to me. I am still looking around very hard for the humidity gauge. The pet stores in my country doesn't seems to sell it. But I will still continue to look for it. As for temperature, my country is hot and humid all year round and temperature range inbetween 27 to 31 degrees. So I think there is nothing much to worry about for the temperture. 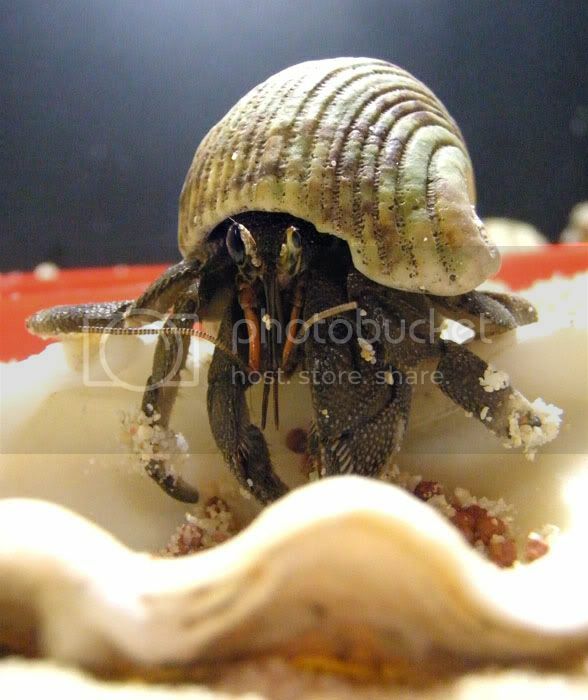 A hermie's lifespan all depends on the owner and the conditions the hermit crabs are kept in. If their crabitat is a "Critter Keeper" with "gravel" or "calcium sand", they will not live over a month. But if they have a tank that is more than 10-gallons, friends, etc. they will live a long and happy life. The longest known successful crab owning thus far (still going on as both crabs are still alive) is 33 years and 2 months. Crabs need lots of exercise and a very nutritious diet to get to that age, though, so give them time to just run around a crab-safe area (like a plastic storage bin) every day and give them a full diet of meats, calcium, fruits, veggies, fats, etc.